Be it due to financial constraints or packed schedules, large-scale renovations aren’t always in the cards. Rather than resigning to living in the same dated interior, consider making a small update that packs a punch, like adding a removable tile backsplash here, or a refreshed bedding set there. On the (quite literal) smallest end of the spectrum you’ll find door hardware. It’s a budget-friendly swap that can change the look and feel of any space, whether you’re updating your bathroom cabinets’ hardware or giving your front door a sleek new handle. California-based Emtek is a leading voice in the field of door hardware, so we tapped creative director, William Zhang, for his insight. Ahead, everything you need to know before you pick out your new hardware—plus, the basics of installation, no TaskRabbit required. What should readers consider before replacing their hardware? Well, you need to identify what type of hardware you are replacing—is it a tubular lock? If so (and this would be a common one), the next step is to determine the measurement from the edge of the door to the center of the handle. This is known as the backset or latch. If it’s for an entry door and requires two latches, like a deadbolt with a passage latch beneath it or a full-length entry set, then you need to measure the center-to-center distance between the two holes. You might also need to know the door’s thickness and the handing, which is based on the direction the door swings in relationship to what side the hinges are mounted on. For cabinet hardware, knobs are straight forward; but if you’re replacing pulls, measure the center-to-center hole spacing. In some cases a backplate or a cup pull can be used to cover existing holes if you want to go with a wider option. Is there a particular style of hardware that works best with a specific style of door/cabinetry, or is it all the same? We don’t want to limit a designer’s creativity, but coordinating similar styles is never wrong! For example, try pairing simple shaker doors with an equally simple pull design like a streamlined Mod Hex cabinet pull. 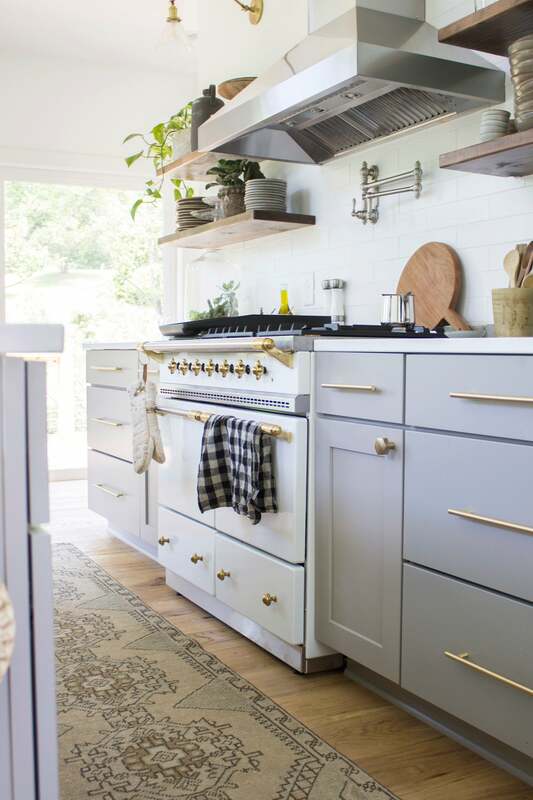 With the popularity of split color or tuxedo-style kitchen cabinetry, you can either go so far as to coordinate by splitting the hardware finishes, or adding some cohesion by using the same finish across both. Selecting hardware can be a personal statement if one feels so inclined; just like a fashion accessory. How long can you expect the whole process (from measurement to installation) to take? Once you’ve completed your first door, the process usually goes a lot faster since doors in a home are usually prepped in a similar manner. I would plan for a few hours to measure and spec out the hardware. Installing the hardware can be a weekend project. How can you use hardware to make cabinets in the kitchen or bathroom feel custom? An aspect of hardware design that I find fascinating is throwing in the wild variable of finish options into the fold. You can totally change the style and appearance of a piece with that simple alteration. What feels like a contemporary pull design in a chrome plated finish will have a totally different feel in a raw unlacquered brass finish. I would start by looking for simple, sleek profiles in less reflective finishes, like matte black or even satin brass. An immediate suggestion would be our line of unobtrusive Cabinet Edge Pulls that mount over the top of your doors or drawers. If you wanted to step the game up and go with a touch of luxe, I suggest some highly-reflective finish options like polished nickel or brass. My favorite design for this application is our Tribeca Door Lever in a reflective finish that will glitz up its sculpted surface. For a rustic feel, look for designs made in unique materials like sand-casted bronze to show off the original surface quality that comes from the sand-made mold it was cast in. You can also achieve a similar look with an oil-rubbed bronze, pewter, or a flat black finish. You can really get creative here and combine other styles with rustic. For example, rustic finishes with modern designs can create a different look—the Rustic Modern Rectangular Entry Set in tumbled white bronze is a great example of this design twist. Can you install hardware alone or should you hire a pro? Direct replacement of existing hardware is definitely a job that should only require basic tools like a screwdriver… and maybe a glass of wine or two. A project requiring new doors and prepping will be a bit more involved, and probably require power tools along with a door prep kit, which can be found at most home improvement stores. It’s something that a DIY-er is absolutely capable of doing, but if you’re uncomfortable with any of this, I would recommend a professional be involved. What are the basic steps of hardware installation? Most cases involve inserting a latch into the door, making sure it’s aligned correctly with an alignment device that’s mounted in the door’s bore hole. Then, the handle trim is basically sandwiched over this. Once installed, tighten a set screw in the handle. Sounds easy enough, right? Whatever your style and whatever your budget, switching out hardware on your doors and cabinetry is a low-lift way to freshen up any room and make a space feel just that little bit more personal. Give your old bedroom dresser chic new pulls, or make your rental’s kitchen feel bespoke with rustic knobs. Head to Emtek to find your perfect style, and save off a weekend for a super easy DIY project even novice decorators can master.